I recently received a call from a pastor asking how to enhance their congregational singing. The church had recently inherited a new building, and the pastor was concerned that the congregational singing was just not “what it should be”. The band was great, and they rocked the place out. But the congregation was feeling a bit overwhelmed and “lost in the crowd”. I am very familiar with this facility because Acoustics By Design was the original acoustical and audio/video designer of the church for a different congregation about 10 years ago. It opened to rave reviews. However, a new church was now worshiping there. They also had a worship band and featured contemporary Christian music, but because of their worship style they wanted to enhance the congregational singing. For such a task, there are three fundamental factors that need to be considered. The first consideration is the style and volume of the music. When we’re designing sanctuary acoustics and audiovisual systems, we generally distinguish between “platform driven” and “congregation led” style of music. For comparative purposes, consider two diverse contemporary Christian worship leaders – Lincoln Brewster and Chris Tomlin. The first church that worshiped in the space was completely platform driven with very high energy levels – like Lincoln Brewster. The first worship leader wanted a sanctuary sound system that could push levels of 95 to 100 dBA throughout the auditorium. Well, he got it, and it rocked! But the new congregation, on the other hand, desired more of a Chris Tomlin worship concert setting. For Tomlin, the band is important, but he tends to engage the entire crowd in the singing. He will often stop singing altogether, and turn the microphone around to the congregation. A very good congregational singing church might produce levels of 85 to 90 dBA, but will be overpowered by a 100 dBA “rock and roll” style sound system. 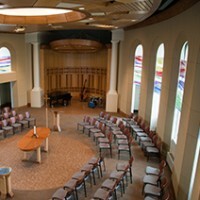 Secondly, the use of appropriate nearby reflecting surfaces will give the congregation a sense of “singing together”. If the congregation is singing into “soft pillows” (such as a stage that is full of curtains, chairs that are stuffed full of padding, or a floor that is completely carpeted), it will be very difficult for them to hear each other because the sound is swallowed up by the room. For successful congregational singing, there must be nearby reflecting surfaces to send energy from the congregation all around the room. For example, we recently designed a church facility (Cornerstone UMC) with acoustical ceiling clouds that are designed specifically to enhance congregational singing, and the results are amazing. Finally, many contemporary church sanctuaries are set up so that the congregation faces the stage, not each other. Since the amplified sound is coming from the stage, and our ears are more sensitive to sounds coming from in front of us, the band naturally sounds louder than the voice of those singing behind us. Do you sing contemporary Christian music at your church, but want to enhance the congregational singing? Play around with just turning down the volume level of the band. If the congregation gets a sense that they are part of the “band” rather than just “the audience”, they’ll be more likely to sing out. Look at hanging ceiling reflectors or eliminating some of the carpet. If you have the flexibility, try some different seating arrangements so that the congregation can actually see each other. Not only will you improve the intimacy of the space, but people will see others singing and will also want to sing along. You’ll be amazed at the difference. At Acoustics By Design, we specialize in designing worship facilities that can “really sing”.